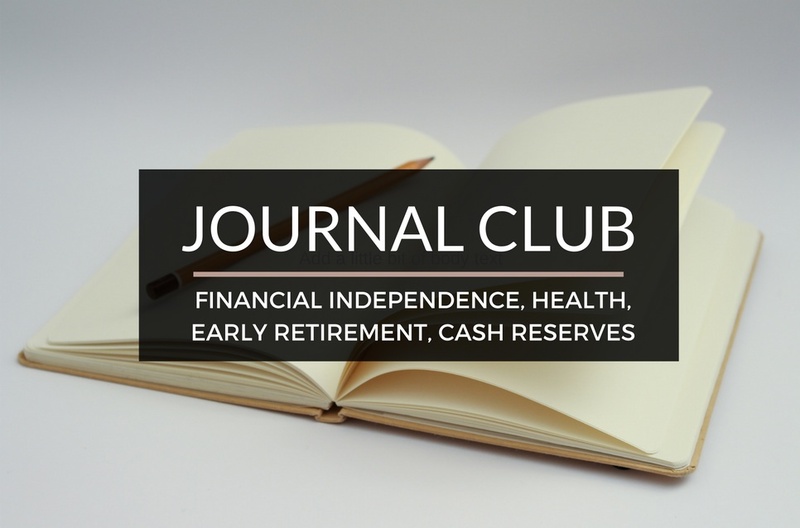 Journal Club 10-22-16 | Passive Income M.D. The purpose of the JOURNAL CLUB is to share a few articles that made an impact on me this week and to give you a few things to read over the weekend. Enjoy! Also note that there a new Sponsor Q&A section at the end where I get a little personal and try to get to know them a little bit better. Financial independence and early retirement are dreams for everyone, especially doctors. In case you need a good reminder of the reasons to be aggressive and push for it, read The White Coat Investor’s 10 Reasons to go for Early Financial Independence. Personally I don’t know too many physicians that have retired early or work purely by choice. However, there must be some that do, and there are many ways to get there. Physician on Fire explores some of those paths in Who are the physicians that retire early? I’m at that age when I’m starting to see how fragile our lives really are and ultimately how important it is to take care of ourselves. Choose Better Life is a blog by an Emergency Medicine physician focusing on that very thing. Take a few moments to read this article and jumpstart your journey to wellness in Improve Your Health in Just Minutes. I’m not a big fan of holding cash reserves because it just feels like it’s wasting away sitting in a low interest account. However with the stock market where it is today, I’ve been thinking about whether it’d be worth it to have some cash on hand in case the market takes a dip and try to jump in then. Joe Udo is a former engineer who now runs an amazing blog for a living, Retire by 40, and touches on this topic in How much cash reserves do you have? Subscription services are everywhere. I have a post coming up on that very subject but Crispy Cabbage beat me to the punch. This is a great primer though and worth the read. Enjoy the entertaining article Peak Consumer: Cash Flow Suicide by a Thousand Box Cuts. Who is the person that has had the biggest impact on your life? You know what they say – behind every man is a great woman. I met my wife, June, 25 years ago and she has been my inspiration ever since. She has helped me grow both personally and professionally on so many levels. I remember when I first started running, I could barely make it a half a mile. Thankfully, things progressed, and she said that I should do some organized races and before I knew it, she inspired me to run the New York City Marathon! How long have you been in the business and what drives you to keep going?